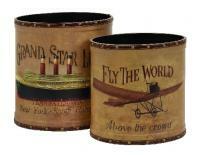 Add some old world charm to your home or office with this unique set of wastebaskets. Beautifully crafted from wood, finished with a faux leather in a transportation theme. A truly authentic look is created with the distressed finish and leather border with gold rivets. For more details visit www.cheapchicdecor.com.